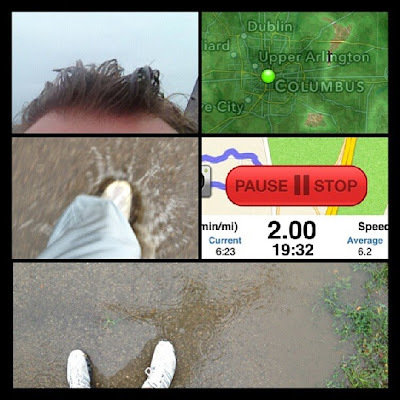 I made a few goals to get out and work-out more. Trying to set a reasonable goal of losing three pounds a month. I think that is obtainable. Start small and keep at it. I also started my new work-out plan. 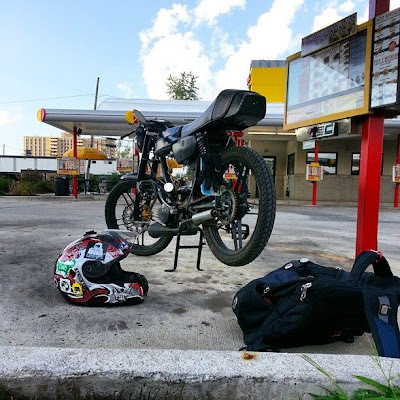 Each week either ride forty miles on the bike or run four miles. I just don't get as much enjoyment running so I set that a little low for the trade-off. I can split the mileage either way... like ten miles biking and three miles running, but it has to be running, no walking. Starting small, but once I get back in the swing of things, I will have to adjust those. I did manage to get my mile split times for running to under ten minutes. That is pathetic compared to what I used to run. My goal is to get that back to AT LEAST under 7 minutes. I also spent a decent amount of time at the garage this week during my days off. I took apart a Murray moped because one of the guys from 1977 Mopeds bought it to make it into a top tank. 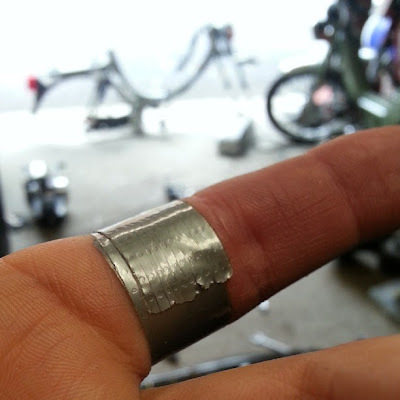 I cut my finger open pretty good so duct tape to the rescue since my garage is about ten minutes from the house. 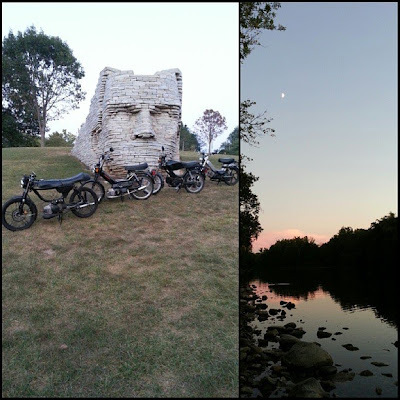 I also tried to coordinate a Thursday night ride. A lot of the guys (and gals) have been wanting to ride more often, but not many showed up. The ones that did... well, we had a blast. 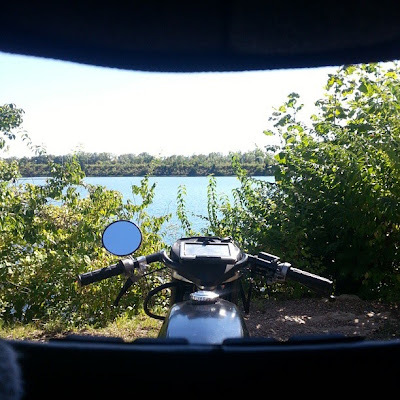 We rode up to Leatherlips and up to the Columbus Zoo then back down to town. Lots of fun, but daylight was not on our side. Saturday morning I helped some of the guys from 1977 Mopeds box up some of the Handy Bikes moped inventory. It is amazing how much "stuff" is in there. I think I boxed up four thousand NOS CEV switches that come on Puchs. I also scored some minty Le Moped gas tank decals. The Le Moped I am picking up from Cleveland has faded decals and this will really bring some life to the bike. I want to make it nice and minty for a stock bike. 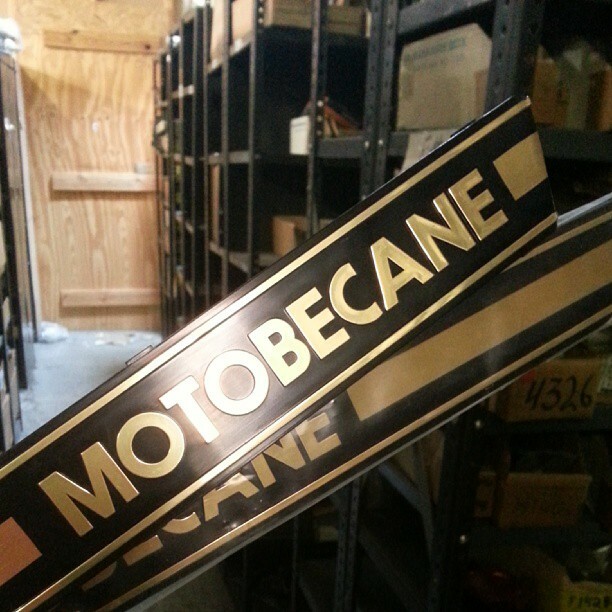 Dan also got a box of Motobecane banners so he said I could have one of them from the walls of Handy Bikes. Since there was an Ohio State football game, there was no early newscast and I had to bounce out of the studio during The Football Fever. So I decided to ride into work and back before I had to go on camera. Great choice. Beautiful day! As for the weather... a little rain overnight and early Monday for Ohio as a cold front swings through. It will be light and scattered, but not drastically dropping our temperatures. We stay dry then until Thursday/Friday. Temperatures remain fall-like and slowly climbing highs from the low 70's to mid 80's by the end of the week. All-in-all, an Ohio fall week ahead. Have a good one!